From bohemian areas of East London and Hackney, we now bring you to highly creative and innovative Amsterdam. With an equally bohemian spirit, the Dutch capital boasts a dynamic shopping scene. Many unique fashion boutiques exist alongside global brands in areas like Waterlooplein and Nine Streets, catering for every taste. Located in W Hotel Amsterdam, this hip concept store, which claims to be the ‘epicentre of Dutch design’, is more than a fashion boutique: it is a destination for the artistically minded. Featuring all types of objet d’art ranging from fashion, jewellery to artwork from local Dutch designers and artists, X Bank also hosts an art gallery and workshop space. Up-and-coming Dutch designers that are stocked at X Bank include Roderick Vos, Lola & Lou and Ink Inklusive Denim. Curated specially by owners Val and Rose Adam, OU (French for where or where did you get that) brings all manner of texture, prints and sparkles into clothing, bags and jewellery. As the OU woman is bright, cheerful and feminine, but not afraid wear statement prints and colours, the boutique adopts tongue-in-cheek approach to make classic fashion too pretty and hard to resist. Check out their Instagram here: OU Boutique Stories. What makes Hutspot unique in the Amsterdam boutique scene is its lifestyle offering for young sustainable creatives. Brands sold at this boutique emphasise the use of sustainable materials and practices to ensure dignified treatment of the workers that produce their garments. After a long day of shopping and browsing, Hutspot also offers you the opportunity to kick back and relax and have a cup of coffee. Who wouldn’t like that? 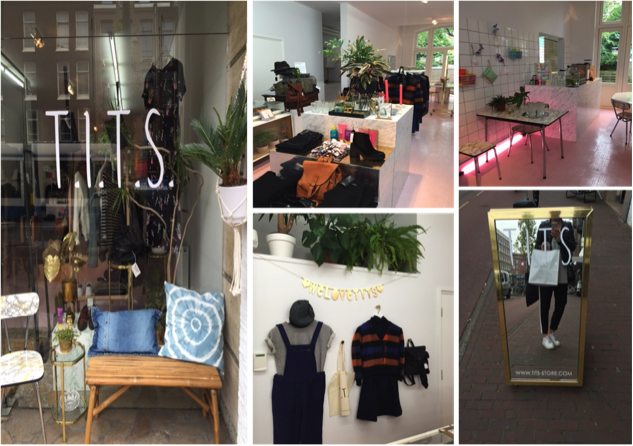 Based in West Amsterdam, T.I.T.S stands for ‘This is the s***!’ and its name definitely lives up to the shopping experience. In here, you’ll be able to find funky and unique fashion pieces ranging Brixton Hats to stylish knuckledusters at affordable prices. Brands carried include indie label Mannish and Frisur and well-known Stussy and Lazy Oaf. Also, in mandatory Amsterdam fashion, coffee is served at the back of the store if you ever need a caffeine pick-me-up. A posterchild of Tumblr’s sleek, minimalistic and white interiors, Cottoncake feels very open and spacious despite being shaped like a pijpela (a long and narrow pipe drawer). Run by owners Tessa and Jorinde, the store only stocks items that they really love and pick up during their travels. Labels you could expect to see are Storm & Marie, Samoe & Samoe, and jewellery brands Mimi et Toi and Monocraft. Things are constantly changing however, as the owners bring in new upcoming designers, so don’t forget to pop in and check it out!